Students will play this game in groups of two to four. 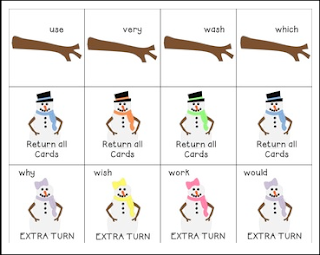 The goal of the game is to collect all the parts of the snowman before the other players by reading the sight words correctly on each card drawn from the pile. The sight words included in this game are the second grade Dolch words. At the end of the game, students will record the sight words they have in their hands on the recording sheet. This game would be great in a literacy center or for review in a small group setting. To find this game with all of the Dolch word lists, please visit Build a Snowman - All Dolch Lists.